Getting familiar with Bible languages can have big benefits — and you may find it’s easier than you think. In recent decades the UK has seen a revolution in food labelling, aimed at giving us much better information about precisely what we’re eating. The raw scientific data that’s now on almost all food packaging makes it hard to avoid knowing at least something about calories, sugar levels, salt levels and so on. Quantities of carbohydrate or of caffeine are part of common conversation. Complete ignorance of these things is not an option and, in particular, no self-respecting parent can eschew reading food labels. Of course, this means that there are a few people who try to use their limited understanding of nutrition to persuade others onto cranky diets, but they rarely succeed or do significant harm because the populace generally has sufficient knowledge and a plethora of other experts to listen to. On the whole, having more information — even quite academic information — has led to a significant improvement in our understanding. So what would happen if we applied this experience to learning Bible languages? There are already many apps, websites and courses that teach Koine Greek or Old Testament Hebrew, but these tend to be hidden from the view of all but those enormously determined to seek them out. What would happen if knowledge of Bible languages — like knowledge of basic nutrition — was hard to avoid? Instead of the Hebrew alphabet being something you have to look up in a special book, what if it were printed somewhere in every Bible? 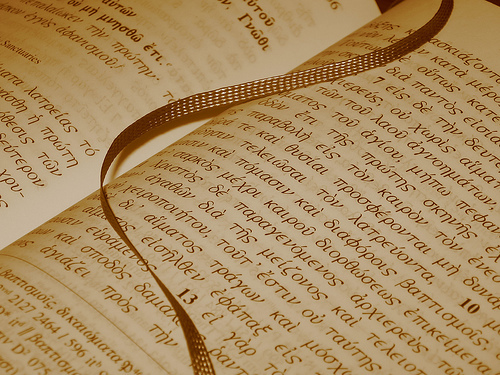 What if popular Christian authors printed Greek in the millions of Christian books sold? What if Hebrew and Greek were available in pew Bibles? Why not in children’s Bibles? The key thing is to start with the desire. Does the Christian Church really want to get to grips with the detail of the Bible? The scarcity of teaching of Bible languages in churches seems to suggest that there isn’t a huge demand from Christians to learn. However, is that because Christians don’t want to know, or because they’ve never been offered the chance or don’t feel it’s within their grasp? Like food labelling, perhaps if Bible languages were more to hand, if we were given more opportunities to learn, the Church would realise how enriching language skills can be for Christian faith. If Christians are passionate about God’s word then they should be concerned about the quality of information they’re getting about the Bible. They should want the closest possible encounter with God’s word. That means, if they can, they will want to know what is said in the original languages. So maybe it’s time to think the unthinkable — that Bible languages are part of Christian heritage, and that familiarity with them should be something that’s normal within the Church. 1) Seeing links: Often a single word or group of related words in Hebrew or Greek is rendered in several different ways in English. This is not something translators can always avoid, but it may obscure the way a theme runs through a passage or book. Learn biblical languages and you can start seeing more links. 2) Gaining and losing nuances: Nuances can be lost in translation but, equally problematically, can also be gained. Learning original languages helps you avoid the mistake of reading into the English an implication that is not present in the original. 3) Gaining confidence: Learning Bible languages makes us more confident in understanding by removing the layer of the translator between us and the text. It demystifies the text by helping us realise that the Bible is written in ordinary language. It also assures us that our translations have not twisted the meaning of the original. 4) Understanding translations: Learning Bible languages helps us to understand why translations vary and to see the limits of their variation. Often there are plausible alternative translations, but most of these are at the level of the individual phrase or word, and do not affect the meaning of the passage as a whole. 5) Understanding others: Learning Bible languages helps us join a large club of rabbis, Reformers, researchers and others who have studied these languages. It enables us to understand the ways they have thought and see what they have seen. 6) Read more in less time: In modern Bible translations an average of approximately three English words are used to translate every two Hebrew ones, and four English words for every three in Greek. This means that when fluency is achieved, it takes less time to read. 1) The script is too difficult: The Hebrew and Greek alphabets are 22 and 24 letters long respectively, and each language can be read with a knowledge of under 50 symbol shapes. Therefore the script is not usually a major problem for learners. By the time you have read a few pages you will have come across each symbol several times. 2) I’m no good at languages: Most people have a good grasp of their native language. The ability that adults have to learn new words and names in their own language is quite close to what they need to learn new words in another language. 3) I’m too busy: You may not have time to master a biblical language, but even in a hectic working life, you need a distraction. Taking a few minutes each day to learn the Greek or Hebrew scripts will give you a better sense of where the Bible came from and an ability to follow more of what Bible commentators say. 4) I have dyslexia: Unlike in English, the spelling and pronunciation of biblical languages align closely. Hebrew words are in fact generally only 2-5 letters long. Experiencing dyslexia in English does not mean you won’t succeed with these languages. 5) I am too old: learning a biblical language is not just a good thing when you have your career ahead of you. It can enrich enjoyment of the Bible at any age. Some, though not all, geriatric specialists believe that learning a second language can help reduce the risk of dementia. 6) A little knowledge is dangerous: This is true when one person with a little knowledge is surrounded by others with even less. Putting nutritional information on food packaging has given many people a little knowledge, but this has not been dangerous because there are now millions of the general population with a reliable understanding of nutrition. BibleMesh offers both Biblical Greek and Hebrew courses online.